Workers at Japan's quake-hit nuclear plant have begun dumping water with low levels of contamination into the sea to free up room to store more highly radioactive water leaking at the site. About 11,500 tonnes of water will be released into the sea at the crippled Fukushima Daiichi nuclear plant. Water with a higher level of radioactivity leaking from the No 2 reactor can then be stored. Efforts to tackle that leak are continuing. 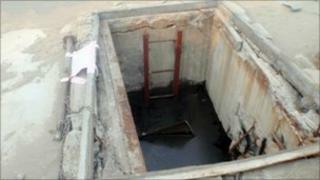 The source of the leak was identified at the weekend as a 20cm (8in) crack in a concrete pit at reactor 2. Workers are now using dye to try to trace the route of the water, after earlier efforts to plug the hole using a highly absorbent polymer failed. Operator Tepco has been struggling for more than three weeks to regain control at the plant after the huge earthquake and tsunami knocked out the cooling systems. Tepco says the low-radioactive water it is deliberately releasing into the sea has iodine-131 levels that are about 100 times the legal limit. But it stressed in a news conference on Monday that if people ate fish and seaweed caught near the plant every day for a year, their radiation exposure would still be just 0.6 millisieverts. Normal background radiation levels are on the order of 2 millisieverts per year. Getting the mildly contaminated water off-site would permit the emergency staff to then start pumping out the turbine building and the much more radioactive liquid in its basement. Workers face a dilemma - they must keep feeding water into the reactors to stop them overheating, but must then deal with the accumulation of waste water. Top government spokesman Yukio Edano said that there was no choice but to release some water. "We are already aware that the water at the No 2 unit is highly radiated," he said. "So as to prioritise to stop the leakage of this water into the sea... we will release the water stored in the exterior building of the unit, which also unfortunately contains radioactivity but far lower than the highly contaminated water." The water to be released into the sea contains some 100 times the legal limit of radiation - a relatively low level, says the BBC's Roland Buerk in Tokyo. "As it is not harmful to people's health and as it is necessary to avert an even bigger danger, we decided it was inevitable," said Hidehiko Nishiyama of Japan's Nuclear and Industrial Safety Agency (Nisa). Stopping the leak from reactor 2 remains the priority, Mr Edano said earlier. Tepco says it will inject the polymer again to try to block the flow of radioactive water as soon as it has identified the path of the leak. As a temporary measure, Nisa is considering building embankments of silt near reactor No 2 to stem the leak into the ocean. The official death toll from the 9.0-magnitude earthquake and tsunami which struck north-east Japan on 11 March stands at 12,157, with nearly 15,500 people still unaccounted for. More than 80% of the victims have been identified and their bodies returned to their families. Search operations within the 20km exclusion zone around the Fukushima Daiichi power plant have been suspended because of radiation concerns. More than 161,000 people from quake-ravaged areas are living in evacuation centres, officials say. A three-day joint operation by Japan's Self-Defense Forces and the US military to find the missing recovered 78 bodies. The operation, which ended on Sunday, involved about 25,000 troops, more than 60 ships and 120 aircraft. It covered Pacific coastal areas of Iwate, Miyagi and Fukushima prefectures.